By default, Windows Media Player 11 in Windows Server 2008 creates playlists in WPL format (files with .wpl file name extensions). This article describes how to create copies of the playlist files in ASX format (files with .asx file name extensions) so that you can import them into the Web Playlists extension for Internet Information Services (IIS). When you import the ASX files in Web Playlists, the equivalent Web playlist files (files with .isx file name extension) are created, which you must then edit to enable them in the Web Playlists feature. This article describes how to edit ISX files in two different ways, depending upon whether you want to serve the media files referenced in the playlist media entries either from the original user folder or from a Web site directory. To install the Web Playlists extension for IIS 7.0 and above, see the Installation Notes section in the IIS Media Services Readme. 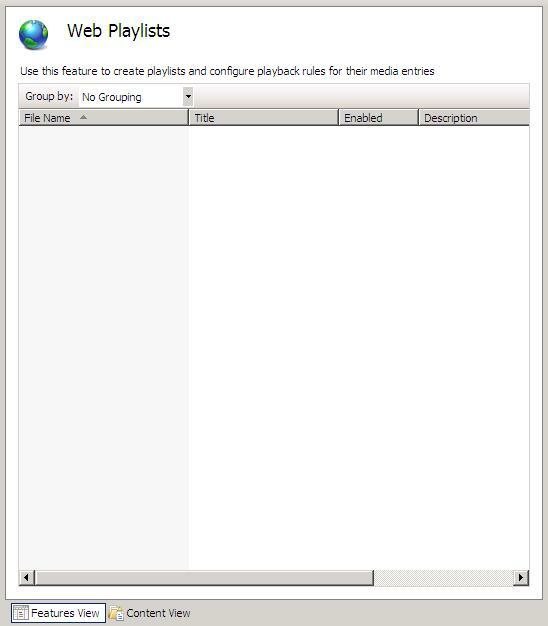 This article assumes that you have created playlists in Windows Media Player on the local server computer using default Player settings. For more information about installing Windows Media Player 11 and creating Windows Media Player playlists, see the Related Articles section. Windows Media Player creates its playlists in WPL format by default. 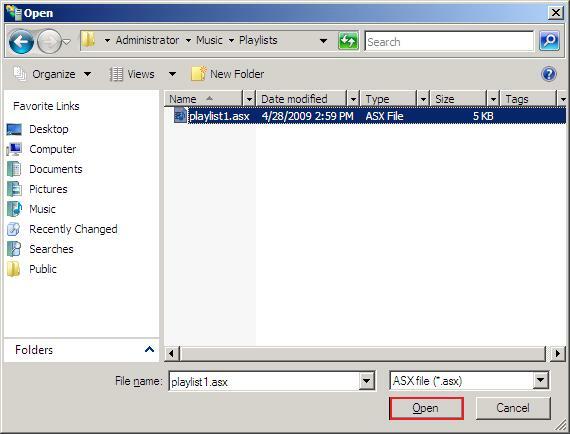 This section shows how to create an ASX-formatted version of a Windows Media Player playlist (.wpl) file to import into the Web Playlists feature. 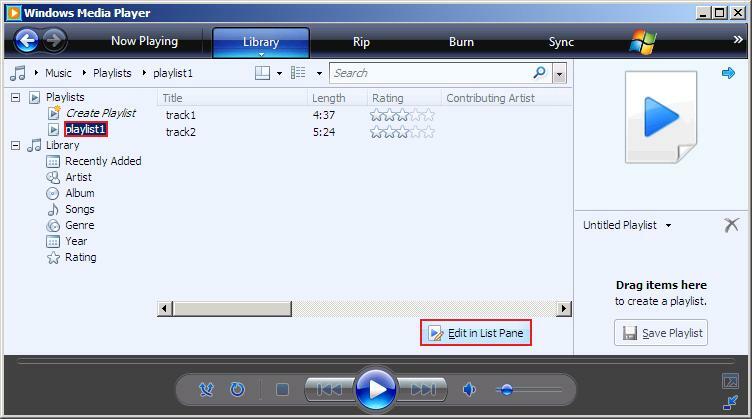 In the Windows Media Player Library, in the Contents pane, select the playlist that you want to add to the Web Playlists feature. Then, in the Details pane, click Edit in List Pane. 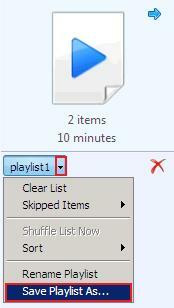 This will add the playlist to the List pane in Windows Media Player. 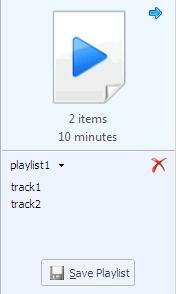 In the following example, we show in the List pane a simple playlist (named playlist1) that contains two tracks (named track1 and track2). Click the down arrow next to the playlist name, and then click Save Playlist As. This action will open the Save As dialog box with default values. In the Save As dialog box, in Save as type, select Any Playlist (*.wpl, *.asx, *.m3u). In the Save As dialog box, in File name, change the file name extension from wpl to asx. 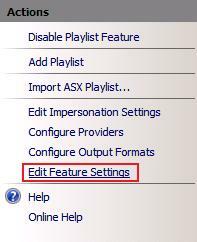 This section shows how to import the ASX-formatted Windows Media Player playlist file that you created in the previous section. 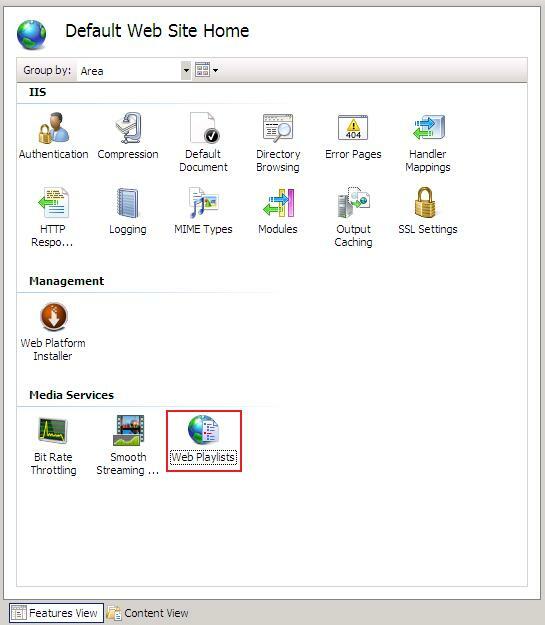 In IIS Manager, select the Web site or virtual directory from which you want to serve your Windows Media Player playlist files (.wpl files), and then in the Contents pane, click the Web Playlists icon. In the Actions pane, click Open Feature. This action displays the Web Playlists feature page. If you have not previously created Web playlists for the site or virtual directory, the page will be empty as shown below. 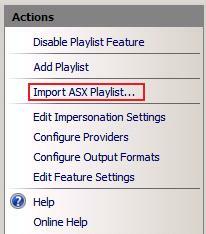 In the Actions pane, click Import ASX Playlist. In the Open dialog box, navigate to the location where the playlist file in ASX format is stored, select it, and then click Open. After you import your ASX-formatted Windows Media Player playlist file, there are a couple of approaches to take regarding how you want to serve the media that is referenced in it. You can either leave the media files where they reside in your user folder, or you can copy them to a folder in your Web site root directory or virtual directory. Your choice really depends on whether you want to maintain multiple copies of your media files. In the Web Playlists feature, set impersonation settings so that it can access the files in the user folder. In the Web Playists feature, enable Absolute/UNC paths. In the ISX file, change relative URIs for the media entries to physical paths. In the ISX file, change the srcType from relative URI to physical path. In the ISX file, remove the param container with invalid extraparam attributes. Copy your media files to a folder in the Web root directory or to the virtual directory. In the ISX file, update the relative URIs for the media entries. In the Web Playlists feature, set impersonation settings so that it can access the files in the user folder. For detailed instructions, see Web Playlists for IIS - Serving Media Content from User Folders. In the Web Playlists feature, enable Absolute/UNC paths. a. In the Actions pane, click Edit Feature Settings. b. In the Edit Feature Settings dialog box, select Allow absolute/UNC paths. Tip You can use the Replace feature in Notepad to make this change to all media entries at once. 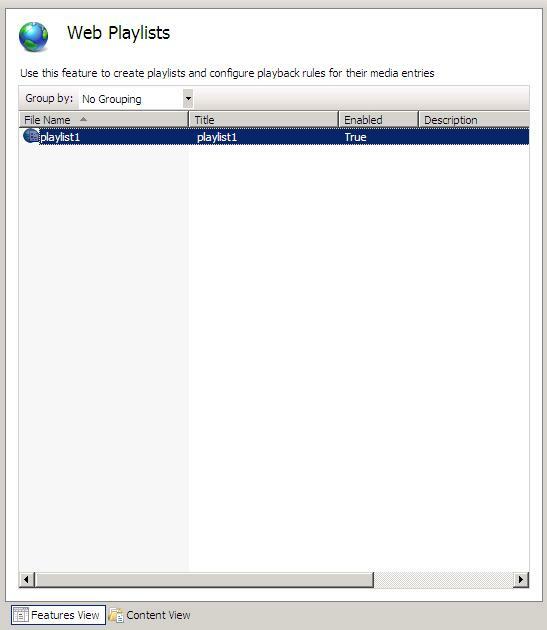 When you import the Windows Media Player ASX playlist file, the Web Playlists feature groups the unsupported playlist attributes as extraParam values in a param container in the ISX playlist file. You must remove (or comment-out) the param container with invalid extraParam attributes for each media entry in the ISX. This will comment-out the param container with the extraParam attributes, as shown in the above example. Copy the media files referenced in the Windows Media Player playlist (.wpl) file to a folder in the Web site directory or to a virtual directory. For example, if you imported the .asx version of the playlist to the Default Web site, copy the files to: <systemdrive>\inetpub\wwwroot\media. After updating the ISX, clients will be able to play the media items referenced in it. By default, clients will have full control of the playback experience, such as the ability to skip (both forward and backward) to different entries in the playlist and to seek within a currently playing track. You can limit a client's ability to seek or skip playlist media entries by configuring media entry settings in the Web Playlists feature. For more information, see IIS Media Services Help. 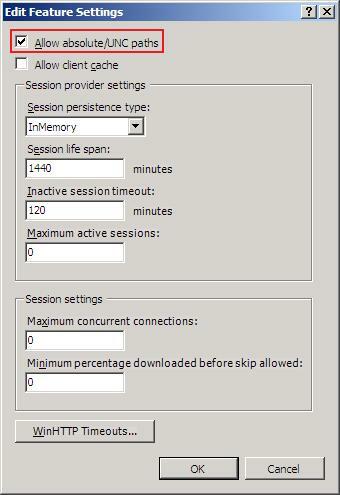 To access this help, press F1 while using the Web Playlists feature in IIS Manager.